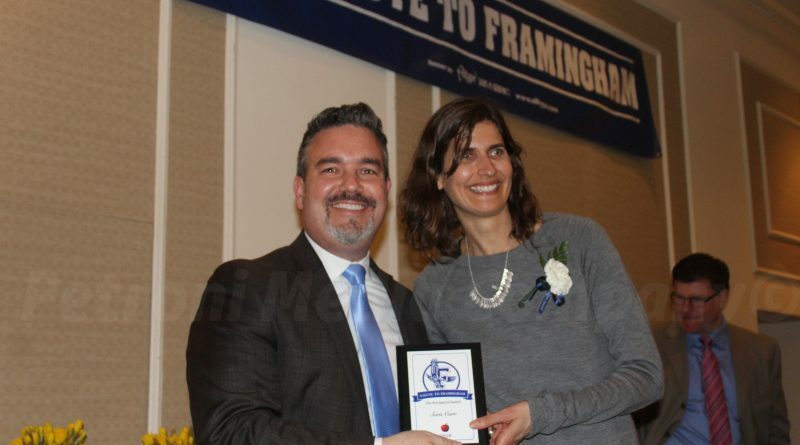 Editor’s Note: This is one in a series of reports on the 2018 You Are Special award winners from the 26th Annual Salute To Framingham. The report below was written by the building principal. Photo by Petroni Media Company. SOURCE will publish profiles on all honorees through June 30. Always Smiling! Sara Carr is the math coach at Hemenway Elementary School, where she has worked for the last 15 years. Sara started teaching in Framingham as a fourth grade teacher in 2002. She had just graduated from Syracuse University with a degree in elementary and special education. After teaching fourth grade for eight years, she went on to teach second grade, kindergarten, and third grade. Sara has taken all of her classroom experience and incorporates her understanding of teaching into her role as our math coach. Despite the Hemenway math coaching position being only part time, Sara has worked tirelessly to support the 28 classroom teachers and 570 students, who rely on her guidance in developing math lessons and effective instructional strategies. Sara is a warm, positive, skilled staff member who always wears a smile…we are so fortunate to have Sara Carr as an integral member of our Hemenway leadership team!